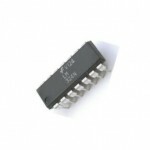 Buy online MCP604 Single Supply CMOS Op Amp in India at lowest price from DNA Technology, Nashik. The MCP604 quad operational amplifier (op amp) has a gain bandwidth product of 2.8 MHz with low typical operating current of 230uA. 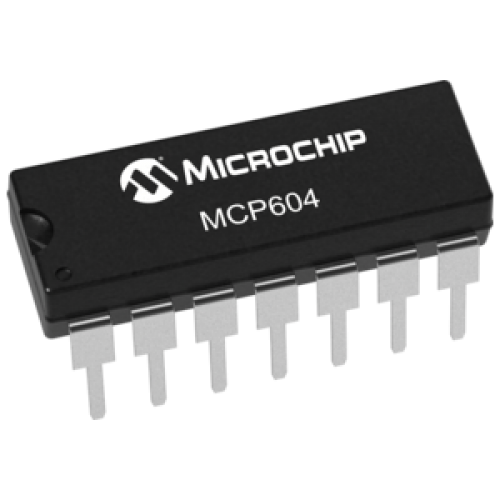 The MCP604 uses Microchip's advanced CMOS technology, which provides low bias current, high-speed operation, high open-loop gain and rail-to-rail output swing. 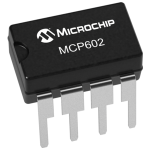 The MCP604 operates with a single supply voltage that can be as low as 2.7V, while drawing less than 325 of quiescent current per amplifier. 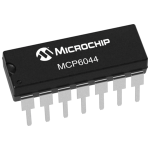 MCP604 Opamp is available in standard 14-lead PDIP, SOIC and TSSOP packages. This amplifier is ideal for industrial process control, low-power battery-operated devices, portable equipment, data acquisition equipment, test equipment and low-end audio applications. LM324 QUAD Op-AmpThe LM324 consists of four independent, high gain internally frequency compensated ..
MCP6044 Rail-to-Rail Input/Output Op AmpsThe MCP6044 quad operational amplifier (op amp) has a gain ..
MCP602 Dual Op-AmpThe MCP602 dual operational amplifier op-amp has a gain bandwidth product of 2.8 M..